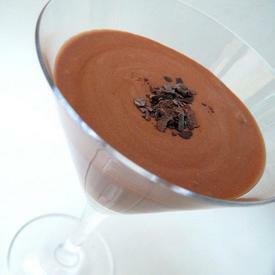 Today is National Chocolate Mousse Day, celebrate with this quick and easy Coffee Chocolate Mousse (no eggs required!). Put the chocolate chips and the coffee in a small saucepan and heat over medium-low heat. Stir frequently until the mixture is smooth. Remove from heat and set aside. Next, in a large mixing bowl put the cream and beat with an electric beater until the cream starts to thicken. Slowly add the sugar, 1 Tablespoon at a time (8 total), until all of the sugar has been added. You may have to beat anothe minute or two until stiff peaks form. Pour the chocolate mixture into the whipped cream and blend gently but thoroughly. Spoon mixture into 6-8 ramekins and chill in the fridge. Note: If you put the mixing bowl in the freezer for about 5 minutes before using, the cream will thicken a bit more quickly.